Up until now, most of the stuff, that I’ve done I’ve been doing in freecad hasn’t required dimensioning. I got the impression that dimensioning functionality wasn’t a particulary advanced feature within freecad until I saw this video by normandc. At this point, I’m content just using the PPA vs compiling from source (To many irons in the fire, so I’m going to try the easy[?] route first to see if I can get this straightened out..
So… I just did and update on my desktop and this is my first. So.. on my desktop Freecad PPA’s appear to be this. And on the laptop we have this. (Which was a bit behind..) So I’m running updated now(which is sort of dumb because I think I’m going to loose the feature I want but a least I’ll know why my freecads are different. Ok. So I just did an update on my laptop I get this. Now what’s really curious is as near as I can tell the draft thing works on my laptop but not in my laptop..
What do I mean my not working? Well, If I’m in Draft in combo view, I get all kinds of options like in Norberts video If you click on Task you get a option to create objects, (where you select dimension) and then it provides a sub-menu under task… All that is blank on my desktop. What I think I got going on, is that certain components are getting double installed or something…. So.. I going to uninstall freecad from my desktop from the software center, delete all freecad related ppas with the gui, update and add the freecad ppas currently on my laptop and install freecad from the software center and see if that works. Ok.. This is what’s for ppas on my lappy toppy. [Edit] Well I got some of the combo views by renaming the .FreeCAD hidden folder that contains configurations so that it would re-generate. That seemed to work somewhat but its not perfect. As for the content of the Tasks tab when in Draft workbench, Yorik (the Draft wb developer) made a few changes since I made that video. While the Create objects / Modify objects actions are still displayed in the tab, the tools that were on top (Workplane button, line width/color face color buttons, etc.) were moved to a floating toolbar that you can move wherever you want. I should also mention that this is called the “Taskview” Draft interface mode, I believe the default interface mode is “Toolbar”, and in this mode nothing appears in the Tasks panel. To change the Draft Interface mode, go to Edit –> Preferences / Draft, General settings tab. As for “pull downs” in the Combo view, I’m not sure what you are talking about. Feel free to email me with more details. 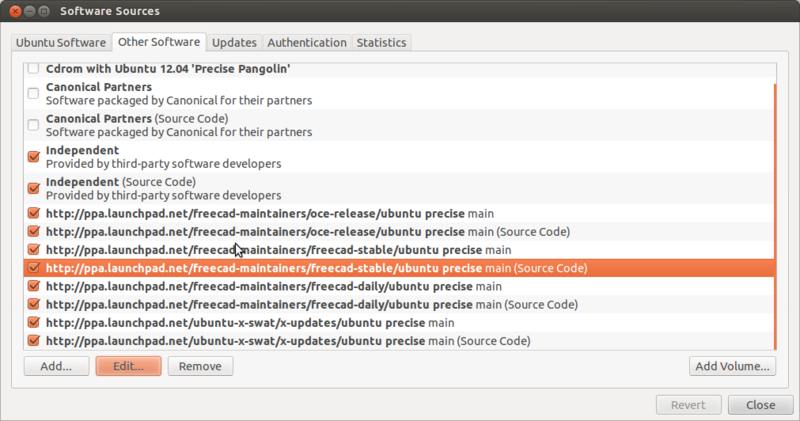 BTW I’m also the maintainer of the FreeCAD PPAs. The oce-release PPA is not required anymore. I created it to upload newer packages of OCE (the ones on the regular Ubuntu 12.04/13.10 repositories were old). OCE stands for Open Cascade Community Edition, the geometric modeling kernel FreeCAD is based on. At the time the freecad-daily PPA did not have enough storage space to host both the FreeCAD and the OCE packages, but I’ve since requested and got more storage space from Launchpad so I copied all OCE packages to the freecad-daily PPA. The stable release of v0.14 should be published in a matter of days (hopefully), once it’s done I will update the freecad-stable PPA with the new release. It seems like behaviour changed a bit from your video, but I guess that’s what development branches are all about. I spent a few evenings trying to figure out the figure out the the magic keystrokes to do what you did.. I had but a bunch of honey do projects and a road trip to check out machinekit that side tracked me. In the process of trying to figure out the keystrokes I ran into a segmentation fault on two occasions, It happened when I switched from horizontal to vertical dimensions with some incorrect key stroke in between. When I get a chance I’ll see if the critter is still in their and what it takes to replicated. Once you understand how to do the draft dimensioning works the wiki instructions make sense, but reading the wiki dimensions alone didn’t work for me. I think a video with audio explaining the keystrokes would be incredibly helpful. I downloaded record my desktop and managed to record successfully, but I wanted work on it a bit.